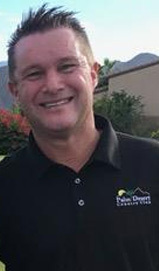 Premier Golf Course. 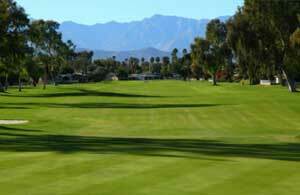 Affordable Golf Packages. 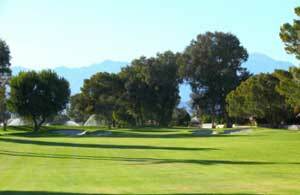 For over 50 years, the Palm Desert Golf Club has been one of the best public golf courses in Coachella Valley. 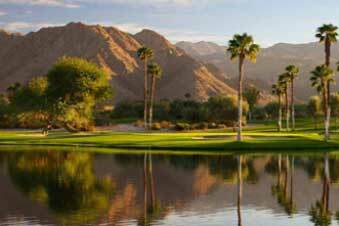 The Palm Desert Golf Club is a public golf course in Palm Desert California. 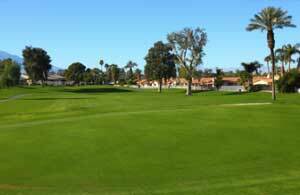 It is an 18-hole, par 72 regulation golf course with a recreational layout featuring lush double-wide fairways. 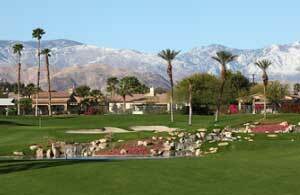 It is surrounded by spectacular views of the Santa Rosa, San Jacinto and San Gorgonio Mountains. 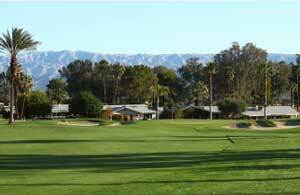 Palm Desert Golf Club also has a modern Clubhouse Restaurant offering pub-style food and drinks. 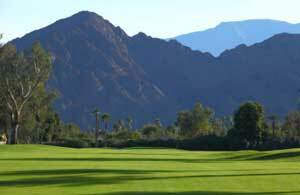 Visit Palm Desert Golf Club and experience one of the best public golf courses in Coachella Valley! Rates & times subject to change. 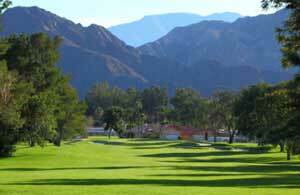 Click here to download the Palm Desert Golf Club Application & Agreement Form. 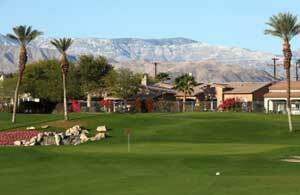 Get your golf game in shape with Palm Desert Golf Lessons! 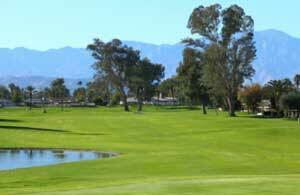 Lessons include chipping, putting, short game, and bunker play. 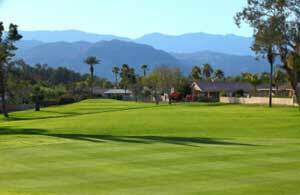 Palm Desert Golf Lessons are the best way to increase your skill level and increase the quality of your golf game. 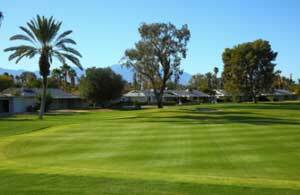 Find out more about our Palm Desert Golf Lessons or contact us today to schedule your lesson. Click on the links below to jump to the hole you would like to see information about. 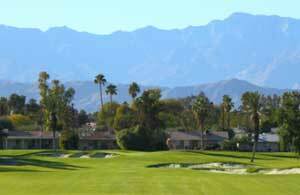 The front nine of Palm Desert Golf Club opens with two great opportunities for birdies. Drives of over 290 yards will clear the bunker on the right – otherwise stay on the left for the best angle. 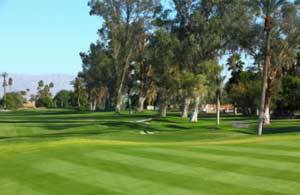 This short Par 5 features the toughest green on the Palm Desert golf course. Getting there might be easy – but getting the score that you want will take discipline. A Par 3 which features a tight green. The green is elevated – so make sure that you select the right club. Precision is the key on this hole. The kidney shaped green is surrounded by water and sand. Good luck! Big hitters will be tempted to go for the green – but watch out for the bunkers in the fairway as well as around the green. 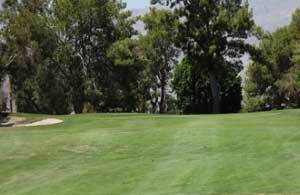 Another tight, strategically bunkered hole – carefully choose your club off the tee. 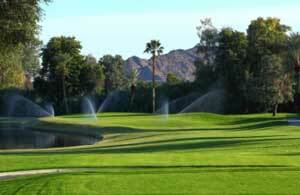 By far the most player friendly par 3 on the course – this will help keep your score low. A big drive will leave a short wedge shot into this elevated but well protected green. Long hitters beware! This par 4 is a difficult tee shot over the water. The ideal play is a left to right tee shot and a mid range iron to the green. Enjoy the stunning waterfall! Keep to the left off the tee to have a clear chance for par. A very nice, but tight hole. A dog leg left requires a tee shot to the right – otherwise danger lurks. Take a minute to enjoy the views. 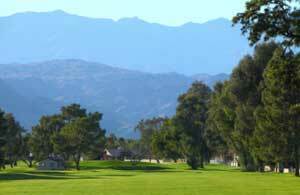 A short par 4 if you can keep your eyes focused on the green and not the beautiful views of the Santa Rosa Mountains! This par 3 is deceptive. It looks easy but watch out for the bunkers and undulating putting surface. This green can be reached in two – if you avoid the bunkers along this narrow fairway. Toughest hole on the course – requires precision rather than strength. A long iron shot is inevitable. The green is treacherous. A beautiful hole – enjoy the view, avoid the water on the right and book a par. 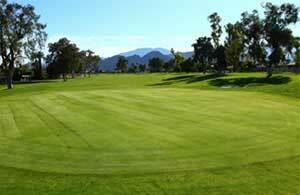 This generous fairway allows you to swing freely. The largest green on the course allows you to dream of a birdie! Accuracy – to the right – is the key to success. The green is level and you’ll be smiling as you make your way to the Clubhouse for a cold one – or two!